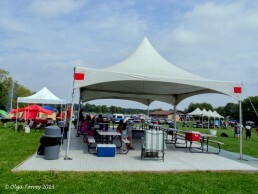 Party Pavilions and Tents are available to rent for your day at Dutch Springs! Each tent comes with picnic tables underneath and a complimentary container of water which will be replenished throughout your day if you desire! Tents are rented to fit the size of your group – there’s no group too big or too small! Large groups are encouraged to reserve their tent at least two weeks ahead of time. Groups of 10 or more can also take advantage of our group rates! Large groups can even plan the ultimate getaway by renting the entire park privately for often less than the regular admission price! Enjoy exclusive access to the park for a truly memorable experience!